There’s something rather restorative about gingery biscuits, don’t you think? Their aromatic spices, warm sweetness and golden hues are the perfect antidote to dark days and biting winds. This is my entry for Susan’s fabulous Eat Christmas Cookies event. Cream the butter and sugar together. Add the egg and stir well to combine. In a small pan, bring syrup and spices to a boil. Add to the butter/sugar/egg mixture and stir well. Sift in the flour and bicarb and mix into a dough. Leave somewhere cool for at least 12 hours (no longer than 48 hours). Pre-heat the oven to 250oC. Split the dough into quarters and roll out very thinly (approx. 2mm). Cut with a cookie cutter and place on a baking tray. Bake for 5 -6 minutes or until golden brown. Keep away from cheeky pups. This entry was posted in Christmas, dogs, Food, Recipes. Bookmark the permalink. Great minds think alike – I baked some spicy biscuits for the tree this weekend. I love the shapes of your cutters! Lovely spicing. Anything with golden syrup does it for me. I searched in vain for a recipe like this yesterday – fantastic Wendy. Now so happy and will be baked soon. Thank you! Oooooh Marco still looks wistful…. Marco is obviously a gourmet . Is he a good eater? Ours are hopeless -unless they think the food is from our plates! I’ll definitely try these as I’m sure we’ll enjoy them for Christmas. Lucy might even make them as presents. I was carefully reading your page and deciding that I would make some of these biscuits tomorrow. When I came to the last instruction I thought whatever does she mean? When the picture scrolled up I couldn’t stop laughing! Well – you would do the same as Marco if you were a dog I’m sure. Great pic and also the wistful one recently. Clearly, Marco has good taste. Thanks for the deliciously aromatic and spicy entry, Wendy! yum! In the unlikely event I can’t eat the lot do you reckon you could freeze half the dough for another time? Gen – No, he didn’t. He had a good sniff though! Pia – His nose was going mad the whole time they were in the oven! Lucy – Really? If you like it on toast then we are kindred spirits indeed! Helen – Hope you enjoy them! Marco’s still looking wistful. He never did get a cookie! 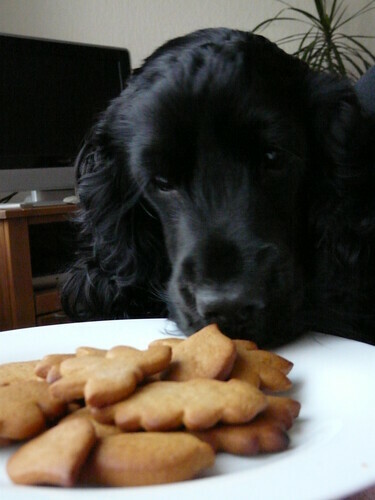 Yvonne – He didn’t used to be but a few months ago we started getting dog food from our vet. It’s Royal Canine and he goes absolutely nuts for it. My friend Gen tried it with her VERY fussy dog and he loves it too. Wendy – Very glad I made you laugh! 🙂 Hope you like the bisciuts. Susan – Thank you for holding the event! BTW – I am amazed that you can take a photo like that without Marco woolfing down the whole plateful in the click of the camera shutter – what self control! I am going to make these today. Thank you! LOVE that snow – how do you do that??? Johanna – He is very good. He just sniffed longingly. Joanna – It’s a WordPress thing found in the extras folder under Settings. It’s a bit cool, isn’t it? thanks for this recipe wendy, they look fab! 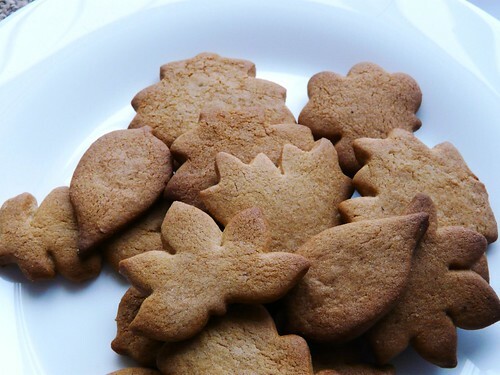 Leaf-shapes are always my choice for spice cookies, too… These look tempting indeed. Megan – He is indeed. His wee nose is always going! Chelsea – The leaf shapes are the only ones I have but I do think they look rather nice! Ginger anything for me – we’ve just made a load of ginger wine, really hot too! I’ve just made these today Wendy and they are very moreish – I’ve had to hide them from Andy. The orange rind does great work. Thanks for another lovely recipe. not sure if i have done this right ~ is it really 500g of flour ~ my dough seems very stiff, also 250 is about the hottest my oven will go ~ is that why the biscuits only stay in a little while? I’ve just made these, & will give a jar of them to friends as a Christmas present. They were very easy to make – mine are little stars and hearts. Because I still had the orange I bought for grated peel;, I juiced it and made orange icing to blob inb the centre of each biscuit. The batch made so many – because my Christmas biscuit cutters are quite small – that I a whole tin of un-iced ones for myself, as well as plnety to give to friends. These taste exactly like they should! I’ve seen a lot of recipes that don’t have the magic ingredient, orange rind. Thanks for sharing!